Take yourself down to Paradise City -- as the great Axl Rose once said -- and you will find more than green grass and pretty girls; you’ll stumble upon a giant yellow pumpkin in the lobby. It is a sculpture by Japanese artist Yayoi Kusama that has come to be known as her alter ego. 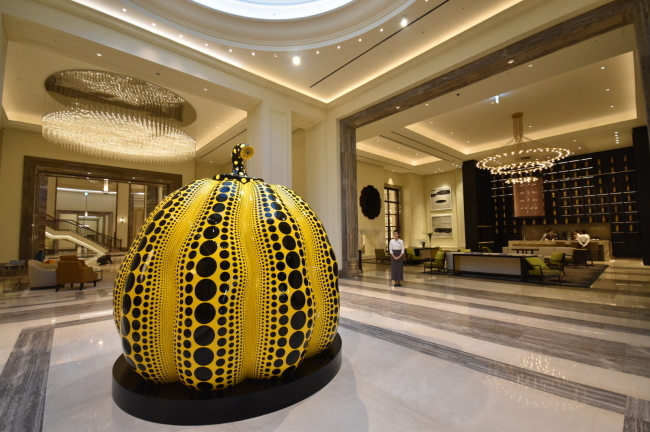 Peculiar, but so is a stroll through the artwork-filled hallways of Paradise City Hotel & Resort, a multi-complex facility on Yeongjongdo, Incheon, which boasts a five-star hotel, convention halls, shopping area, casino, and high-end restaurants, along with art galleries. “We wish to create a place where (guests) can experience all aspects of Hallyu, from culture, beauty, fashion to food,” said Shin Im-chul, marketing director of Paradise Sega Sammy. “Just visiting here would be entertaining, as guests can look around as if they are in an art gallery. 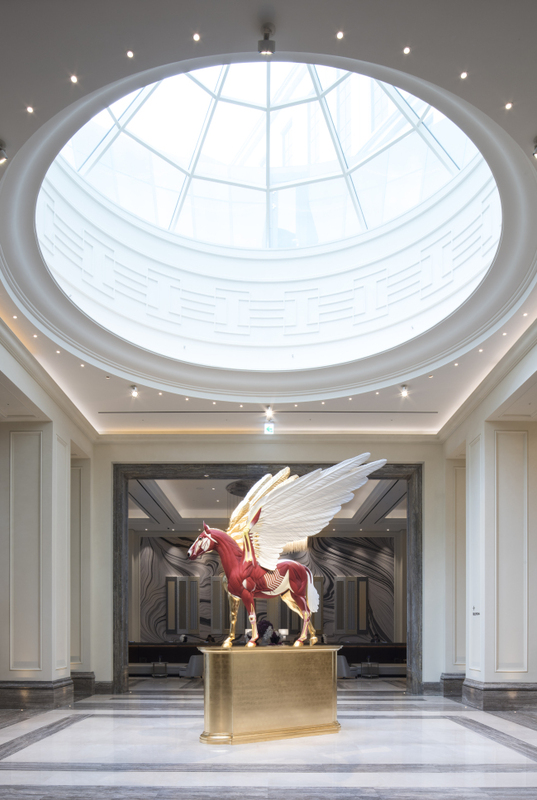 The resort’s design pursues the concept of what the company calls “Art-tainment,” combining the experience of viewing art pieces along with various forms of entertainment. The plan is to exhibit 2,740 art pieces, most of which are already on display. They include work by British conceptual artist Damien Hirst and Alessandro Mendini, whose gigantic sculpture of a chair welcomes the convention center visitors. The sculptures and paintings are spread across the 339,000-square-meter campus, which lies about 1.1 kilometers, or a five-minute shuttle bus ride away, from Incheon Airport. A piece of advice to first-time visitors: After taking a few steps past the lobby, look up upon reaching the giant spiral staircase. The diamond-shaped lighting composed of crystals -- designed by local designer Mioon -- is a sight on its own, but wait around and you will see the structure shifting shape once each hour. Venture a little deeper into the facility, and you will be lured by bright colors and “ka-ching” sounds from the casino. With the capacity to host 1,200 people at once, the facility holds 450 machines across 15,529 square meters. In addition to the games on the open-floor venue, separate rooms for VIP guests can also be reached upon request. Unfortunately for Koreans looking to try their luck, the casino is accessible only to those with a foreign passport. But the casino is hardly the only facility worth visiting. A spacious indoor/outdoor pool, fitness center, family lounge and bowling alley are some of the features. At the “kids’ zone” children can take part in various themed games. The convention center has one of the largest grand ballrooms in the country along with various meeting rooms and event halls. What is said to be Korea’s only Royal Salute and Perrier-Jouet lounges are located on the second and third floors, where guests can indulge in the luxury of fine drinks. The presidential suite, royal suite, pool villa and grand deluxe pool villa come with hefty price tags, although the multiple bedrooms, in-house conference room, dining area and luxurious bathroom will tempt you. 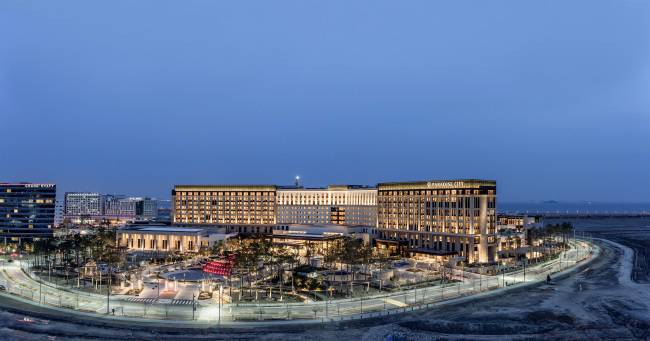 In a bid to attract a wider range of guests, the hotel is offering promotional packages that start at 300,000 won ($264) for a one-night stay, breakfast buffet for two and access to the fitness club, minibar and Sony PlayStation Zone. Packages for annual fee paying members of the hotel start at 230,000 won. 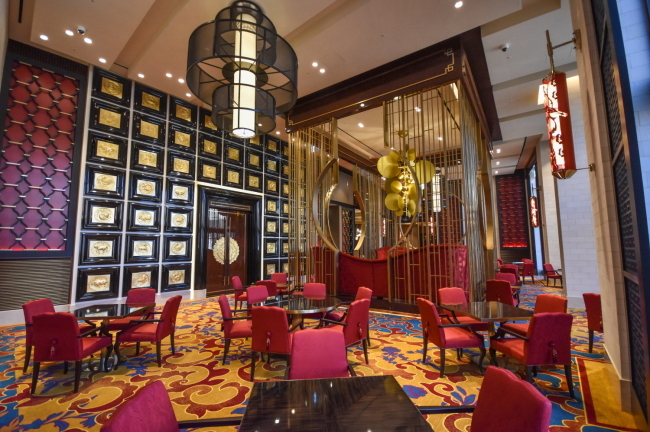 Of course, those visiting would have to come prepared to spend much more, with Paradise City hosting seven restaurants, including the Michelin-starred Chinese restaurant Imperial Treasure. Perhaps an added bonus for some, those staying in airport-side rooms can take in a view of airplanes taking off and landing on the runway. The windows are bolted shut due to concerns about noise. In July 2018, the resort will open the remainder of the facilities. This includes Time Plaza, the shopping area; Wonder Box, a gaming facility for young children and their parents; Cimer, a spa facility; and Chromite, a night club. The aforementioned opening promotion is available until June 22. For more information, call 1833-8855 or visit www.p-city.co.kr.